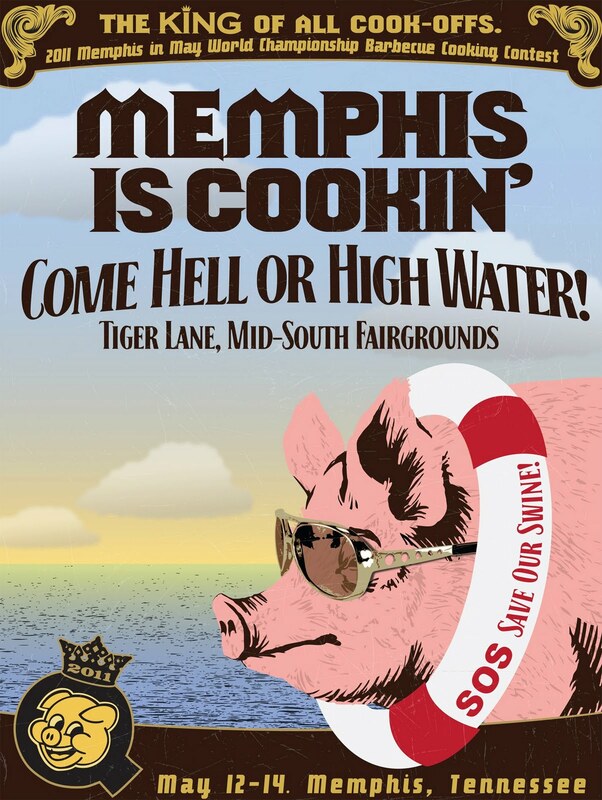 Memphis in May's annual World Championship Barbecue Cooking Contest is this weekend and the smell of pork and "everything else" will be wafting across the Fairgrounds very soon thanks to Mississippi River flooding causing a change of venue to newly-completed Tiger Lane. 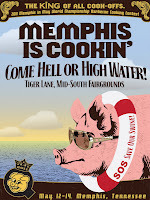 I love the Memphis in May marketing teams BBQ contest poster this year - check it out to the left. While the recent heavy rains here and to our north have forced a location change, unfortunately that doesn't guarantee a dry event! The MWN Forecast has all the details, but it looks like BBQ teams will be dealing with a few scattered thunderstorms this afternoon (hopefully not over the Fairgrounds, because these could have some heavy rain associated with them). Then, after midnight, a round of showers and thunderstorms will move into the area, perhaps lasting until Friday morning. For Friday, a cold front inches closer to the region with thunderstorms re-developing during the afternoon and lasting into the evening. The Mid-South is under a Slight Risk for severe storms during this time period, so a few storms could pulse with hail or a brief high wind gust. Most will remain below severe limits, but will produce some areas of heavy rain and lightning. If you plan to be at the BBQ Contest Friday afternoon/evening, bring an umbrella and plan to take cover if skies turn threatening. 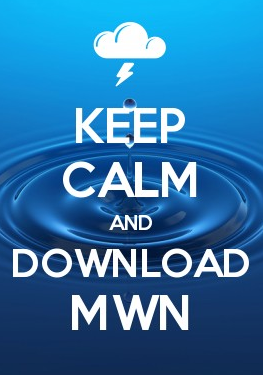 One great way to stay on top of the latest weather information is via the MWN iPhone and Android apps - links are provided at the bottom of this post. Post-front, we'll be under the influence of an upper level low throughout the weekend. This will result in much cooler temperatures, mostly cloudy skies, and low chances of showers Saturday and Sunday, with highs only in the 60s! Monday will transition from cloudy/cool to a little more sun. Then, the middle of next week looks fabulous with springtime temperatures in the 70s and abundant sunshine! I'm a little concerned about the soem thunderstorms. Are they worse than the regular kind??? ?